Hey Look, More Fancy Street Fighter Shirts! 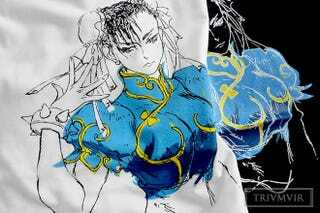 Launching yet another line of Street Fighter clothing, label Triumvir is about to release a new range of t-shirts inspired by Capcom's World Warriors. The shirts, following on from the line released earlier this year, depict some of the series' characters with images based on their original concept art. Chun Li, Ryu and Cammy will all be available for pre-order starting tomorrow from Triumvir's site, with a peek at Chun-Li above.